POP·X BURSTING IN ANN ARBOR SOON. 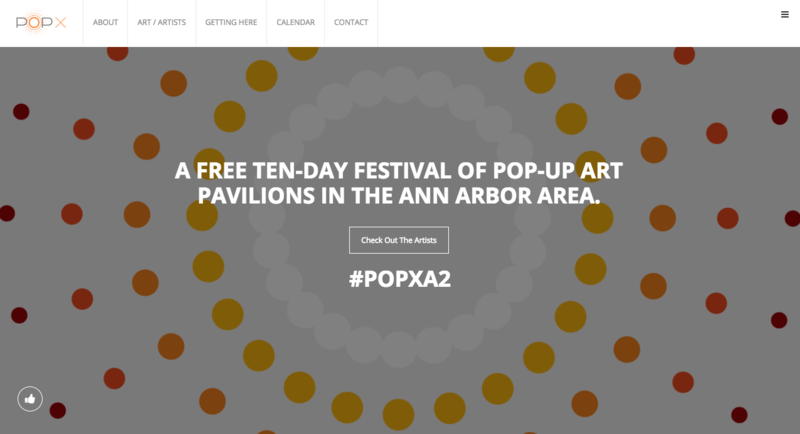 POP·X is a ten-day festival featuring 10 exhibition pods, 100 sq. ft each, that form the core placemaking and presentation vehicles for festival activities, including interior exhibitions of contemporary arts and exterior programs that use each structure as a host for a curated set of events: live art making, music performances, media projections, classes, etc. Ideal installations in the pods value sustained or interactive engagement by visitors and inspire those visitors with dynamic, thought-provoking, or fun expressions of contemporary arts. The inaugural festival is October 15-24, 2015 in Ann Arbor’s Liberty Plaza Park. This park is located in the middle of downtown at a below grade level and is highly visible given steady and robust sidewalk and street traffic. As a community, Ann Arbor benefits from an abundance of arts and culture activity, both affiliated and unaffiliated with the University of Michigan. POP·X will continue nourishing community members and visitors with even more opportunities to engage creativity, explore self-expression, and be surrounded by art.